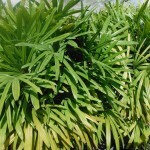 Lady Palm (Rhapis excelsa) - Richard Lyons Nursery, Inc. Almost everyone, whether a plant lover or not, knows the Lady Palm — if not by name, at least by sight — for it is one of the most successful indoor palms in use. Because of its easy adaptability to low light and dry air, it graces interior landscapes in containers of all sizes at malls, offices, hotels and airports. And yet, until the 1960s it was hardly seen in the U.S.A. This palm, botanically known as Rhapis excelsa, is no longer found in the wild, but is considered to have been native to southern China, Taiwan and perhaps northern Vietnam. The genus name is the Greek word for needle, and a form of it is repeated in the name of the Needle Palm, Rhapidophyllum hystrix. In the 17th century, Rhapis was taken to Japan for use in the palaces of the Tokugawa shogunate, a feudal military government. 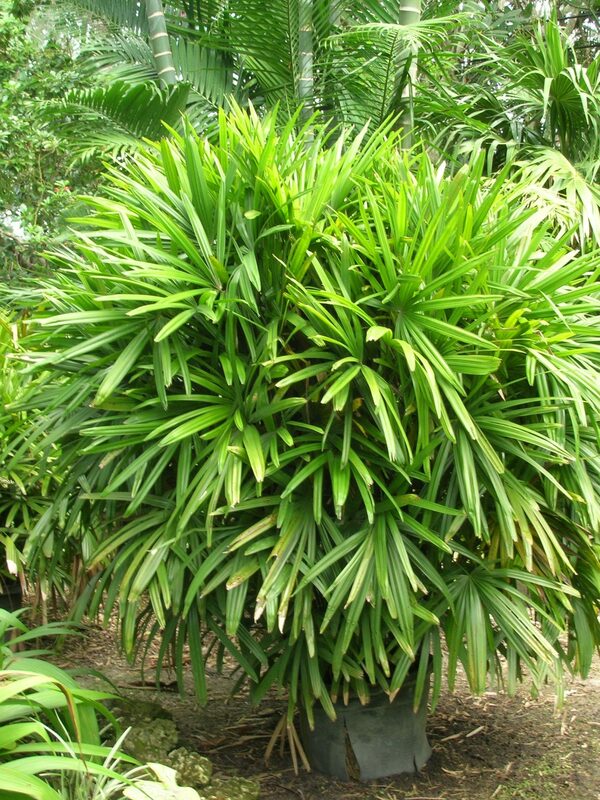 Later it was introduced to Europe, and by the end of the 18th century, the Lady Palm was a prized possession of conservatories in northern Europe. The U.S. was thus a Johnny-come-lately to the appreciation of this species. R. excelsa is a palmate species belonging to the wide-ranging subfamily Coryphoideae, which includes in its membership Corypha, Licuala, Coccothrinax and Washingtonia, as well as pinnate genera Phoenix and Caryota! Its glossy blade, or leaf, about 8-12 in. wide, is deeply cut into segments. 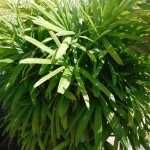 It grows 12-13 ft. high and produces multiple thin stems. Each stem is wrapped in dark fibers which may fall off as they age, revealing a smooth, ringed, bamboo-like cane. No part of the species bears spines. 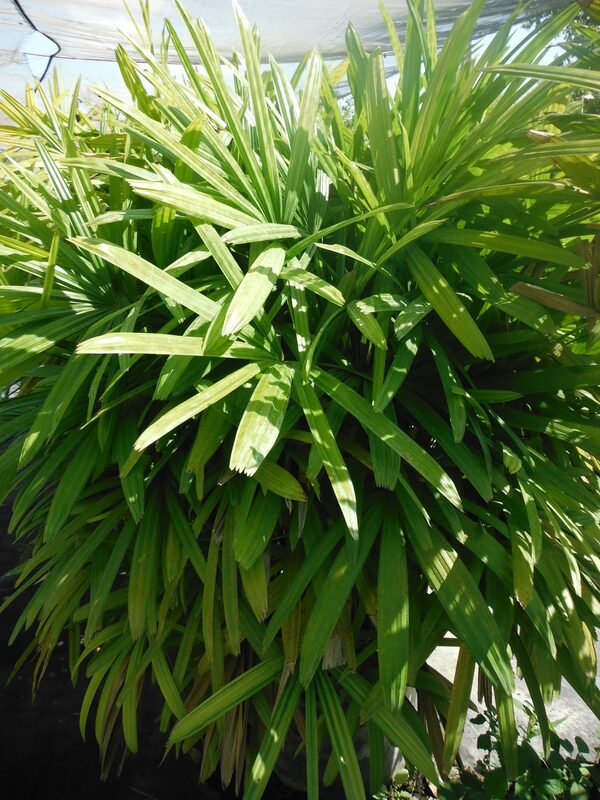 As an outdoor plant, The Lady Palm is very undemanding and grows well in a variety of soils, so long as poor drainage and salt are avoided. Cold is never a problem for it in southern Florida, since it seems to be hardy down to 22°. For best appearance, it should be grown in filtered light. Exposure to full sun will turn leaves yellow-green, especially if good soil moisture is not maintained, and the tips of leaf segments will turn brown in the hottest months. R. excelsa spreads via underground rhizomes which produce new shoots. The shoots sometimes emerge from the drainage holes of containerized plants and can simply be clipped off. However, if the owner wants to propagate the new plant and the container is not valuable, the pot can be sacrificed so that a longer piece of the runner can be obtained to preserve some roots. New plants on the rhizomes of in-ground specimens can be similarly removed. (A fungicide application to the cut end is also recommended.) The important thing to remember is to pot up the offset immediately. If potting is delayed and the rhizome cutting dries out, it will be virtually impossible to save. 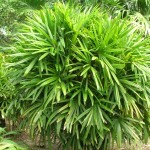 The Lady Palm can, of course, also be propagated from seed, but the species seldom produces fruit in southern Florida. For poorly-understood reasons, 2013 seems to be one of the rare instances in which mature white fruit has been observed on some established plants. R. excelsa can be grown in containers for a long time, although occasional repotting is necessary once stems fill the capacity of the pot. But one of the most valued traits of the species as an indoor plant is its slow growth rate, and a specimen may well be kept in the same container for a number of years. Outdoors as a specimen plant, the Lady Palm is not only striking by day, in or out of the ground, but it can also be shown off well at night with underlighting. In addition, it can also serve as a very attractive, dense screening element in the landscape. It has a history of being fairly free of pests and diseases, although indoor specimens should be inspected for red spider mites from time to time. 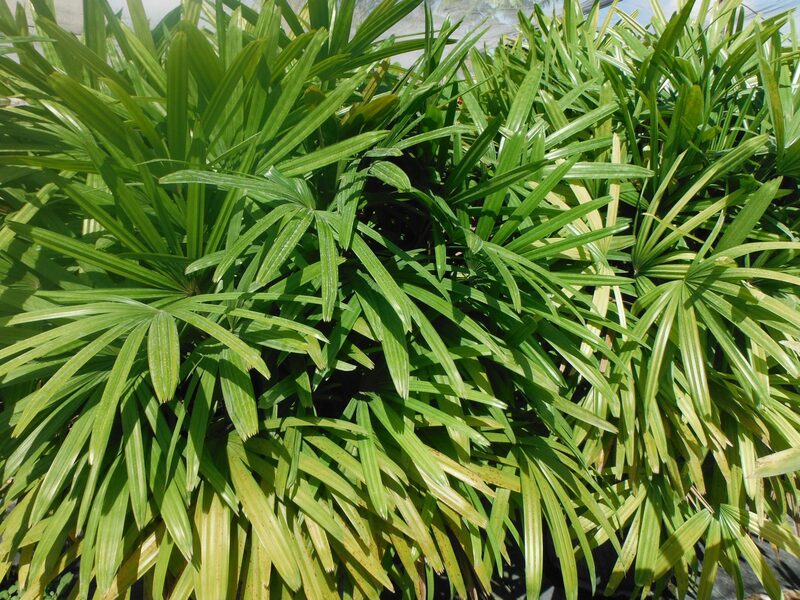 This popular, dependable palm is available at Richard Lyons’ Nursery in 7-gal. and 15-gal. containers.